What’s “IN” now among young Japanese women is using pastry cream and fruit for daifuku filling in place of traditional “an (sweetened bean paste).” On several Japanese foodblogs, I’ve seen combinations like pastry cream and strawberry (or melon or banana), or pastry cream and chestnut cream, or even pastry cream+whipping cream+fruit. Someone did cheese cream (mixture of cream cheese, sugar and lemon juice) daifuku without fruit but it could be good with some kind of fruit, too. I’ll give it a try next time. 3) Banana, pastry cream, whipping cream and coffee-an ← No photo. 4) Pastry cream, whipping cream and chestnut cream. I liked the ones with coffee-an. The coffee-flavored sweet bean paste may not be great with all kinds of fruits, but I liked it very much with strawberry and it was OK with banana. I’ve learned that piping cream into small flat balls and freezing them beforehand helps a lot when making cream-filled daifuku. You need to wait until the cream thaws before you take a big bite, but it doesn't take too long, so no big deal. P.S. * My friends just told me that this type of daifuku was probably "in" a couple of years ago and nothing new any more... :P I guess many women got inspired by the wide variety of flavors that "MOCHI CREAM" (franchise confectionery by comme ca ??) introduced. I heard they have more than 20 different flavors of sweet bean paste, cream and their combinations. Yay! I have the right glutinous rice flour for this! I must try making this now. your daifuku looks very nice! 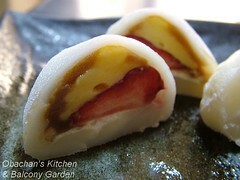 I love classic strawberry mochi, so this whole cream thing is a bit hard for me to accept, hehe. Now that I tried making frozen daifuku myself, I’m amazed that the mochi skin of yukimi daifuku (the one filled with ice cream) can stay that soft and elastic when frozen with ice cream. I followed your recipe for making daifuku and I actually made it! Thank You! I covered the whole thing in cinnamon powder in order to hide my mistake. haha! It worked nicely because I made red bean paste with cinnamon:) So I was thinking maybe I can try making it with pastry cream and fruit... Could I use instant jell'o pudding instead of pastry cream? Does that sound bit weird? I still can't believe I made it! Instant jello pudding? I don't see any reason why not. Enjoy! I definitely want to try and make this mochi now! Question for you. My friend recently brought back some white peach mochi from Japan (the shiroan was flavored). Suggoku umakatta desu yo! 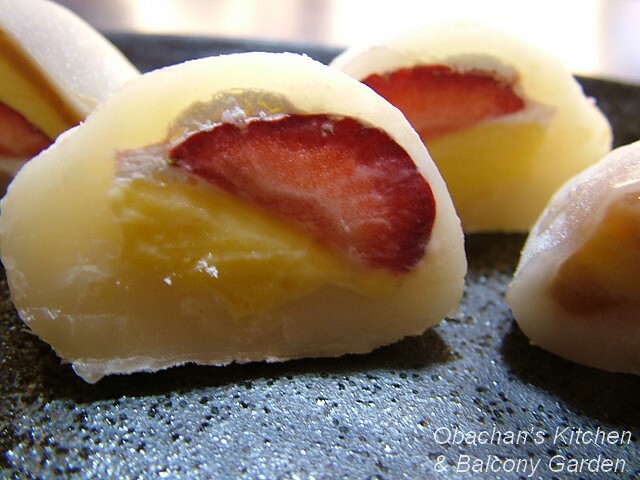 Do you happen to know a recipe for white peach mochi? 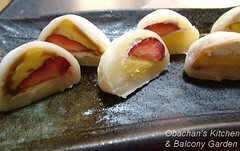 Or maybe just do nama cream momo daifuku instead of ichigo daifuku? And what do you do the nama cream? Do you whip the it, and then pipe it, and then freeze it? Thanks for your info. I didn't know there was such a thing as momo (peach) daifuku, but looks like I missed a lot. I googled and found a bunch of momo daifuku posts. Unfortunately, all of them were about store-bought ones with real white peach and shiro-an (sweetened white bean paste), and the shiro-an was not peach flavored. Obachan - belated happy new year :) Not having been to Japan for a few years I have no idea what's in (and out) there but those daifuku do look delicious indeed :) I really miss the texture of Japanese sweets. Well, here in Japan, natto was definitely IN last month, but not any more. Talking about texture of Japanese sweets, I crave for ういろう once in a while. There's something about its texture that attracts me very much. Hello! Your recipe looks wonderful! I was wondering what recipe you used for your pastry cream though.. I've been looking for one for so long! Thanks! So sorry that I didn't respond earlier!! I usually use this recipe(see the comment section) that "a fellow baker" gave me and gives it a few of my own twists. Hope this helps!